After several years of exploring the Tweed, we have grown to enjoy many and varied bushwalks and cycle trips. To narrow this down to favourites is not easy, but a couple stand out for a variety of reasons. These include varied terrain, uniqueness of vegetation, outstanding views and access, and we like them. Outstanding views and quiet roads (some gravel) through pockets of beautiful rainforest, is a feature of this ride and a relief on hot summer days. A mountain bike is the most suitable but a wide tyred road bike is fine. The ride can be undertaken by competent riders of average skills and fitness, and takes between 2 and 5 hours depending on fitness levels and your desired pace. As on all rides, water, food and tyre repair kit should be carried. This ride covers a variety of road conditions and terrain, and features a swift, long down-hill and a five kilometre grind up-hill at the very end. 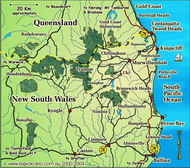 Cars can be left at the NSW/QLD border gate. The starting point can be altered to suit. If a long hill is not your idea of a good finish to a ride, then it is best to start the ride from Murwillumbah, heading out of town past the showground following the signs to Tomewin, up the hill to the border gate and back into Murwillumbah via Glengarrie Road. On the NSW side of the border gate ride down Glengarrie Road. The road is well formed dirt for a few klms then deteriorates to a fairly rough dirt road (road bikes may have to be pushed at some sections). Glengarrie Road is undulating with twists and turns for several klms, through rainforest on the steep hills. Take your time on this section as the environment is pleasant and the odd vehicle can be encountered (people live on this road). Nice views over the Tweed Valley can be seen to the south east. Proceed to end of Glengarrie Rd where you will eventually get onto the bitumen, and pass through the small hamlet of Carool. This road leading to Bilambil has some undulation, but eventually a glorious down hill for several klms (don't forget the views). The next time you apply the brakes you have arrived at Bilambil; a quiet village on a nice creek with a general store for provisions if needed. Turn right at the round-about. You are now on Urliup Rd in the Bilambil Valley. The going is relatively flat with the first few klms bitumen which turns into well formed dirt. Up to the right are the hills you have just traversed. Once again the riding is through small acreage farms and rainforest. There are several bridged creek crossings and the odd undulating hill. The riding is most pleasant, with nice valley views before a last zig zag hill up and over Urliup Road. At the top, the dirt once again turns into bitumen with a lovely down hill run to Dulgiugan Road. Turn right at the T intersection and immediately on your left is a nice little rest spot, the "Pat Smith Reserve", a shaded area right beside the Rouse River. Over the little bridge and you will find another T intersection, to the left is Murwillumbah. If you started at the Tomewin Border gate you must turn right, passing Dungay Public School and up Tomewin Hill, all 5 klms of it, and in some cases quite steep, but bitumen all the way from here! Your reward for this hard riding is the spectacular views of the Tweed Valley and Mt Warning from various vantage points; in particular Gruners Lookout, which is an interesting spot not too far from the top of the hill. Finally the road levels out and you have about 2 klms to coast back to the Border Gate. Well Done! There are many variations to this ride, a look at a local road map will present many options to you. ENJOY. * Please note: Some road conditions will have changed, and contact details in this story no longer apply.